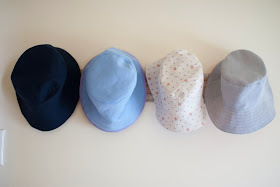 For those of us in the southern hemisphere, Kid's Clothes Week in "fall" aligns well with the start of the summer hat wearing season. This time last year I cut out seven hats in advance and sewed one each night for a week. The kids have outgrown those hats so it was time for some more. 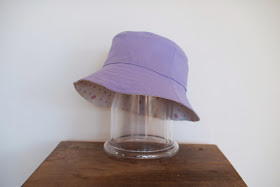 First up for A, the Bucket Hat from Little Things To Sew. Last summer's version was a size small with some shoestring straps. This year, a size medium for a big girl who's learned to leave her hat on! The pattern is truly reversible, and if you're neat enough (tip coming...) then it's hard to tell which is the side that's meant to be the outside! P had just slightly outgrown the Large size. I thought about upscaling the pattern but just went with sewing a 3/8th inch seam instead of 4/8th inch and that gave enough extra room for this year at least. I don't think my kids have bigger than average heads, but the measurement put him at the upper end of the size range for the Large size. He's five and a half years old, and the pattern suggests the large size is for 6 to 8 year olds. Maybe he does have a big head after all. Most importantly, be sure to measure your kid rather than go by age alone. I've made the Bucket Hat many times now and the instructions are great. 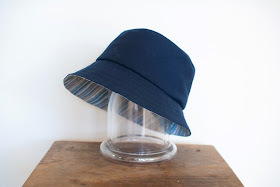 I especially love the oval shape and the generous brim. This pattern has a round crown and quite a different shape. It comes with four different brim widths for each size (this is the second widest) and lots of suggestions for finishing the brim. 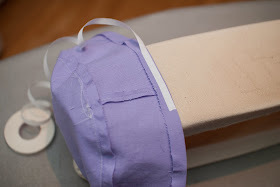 Here I used binding cut on the grain which the pattern says will pull the brim up into a sharp bend. It doesn't really. 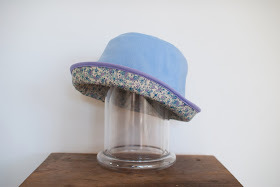 this brim will happily be down, although I guess it curves a bit. if you wanted it to be completely straight out then you'd use bias cut binding. These tips are in the pattern instructions. 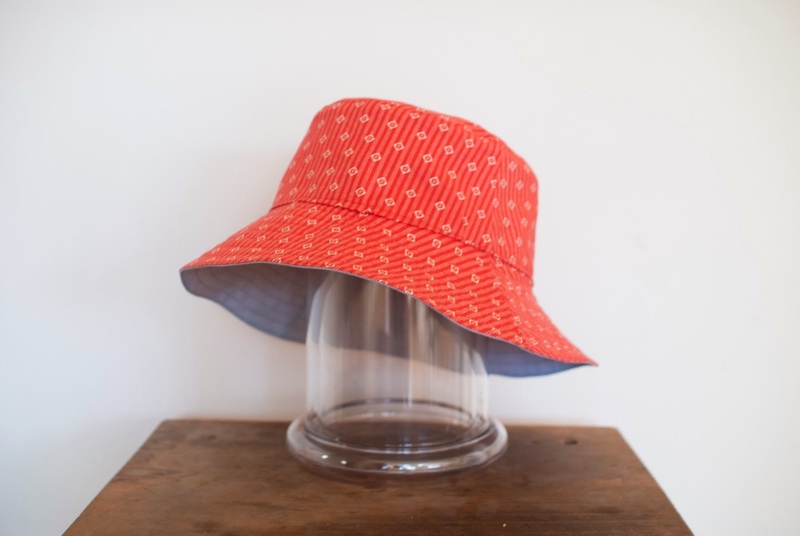 The pattern has the side piece and the brim piece cut as single pieces, whereas the Oliver + S hat has two symmetrical pieces with seams at the side. The brim is a bit narrower at the back than the front. Because of the single piece patterns and some very strict rules about cutting on the bias it uses more fabric than the LTTS hat. But because of the bias cutting it comes together a lot more easily and it's not necessary to clip into the seam allowances. The instructions show the crown being "eased" into the side section without any pins apparent in the photo. I've made it four times but I'm not that good. I use a lot of pins! Essentially you make the outer hat, then the lining hat. Put them right sides together, sew most of the way around the brim before turning them right side out and finishing by edgestitching the brim closed. 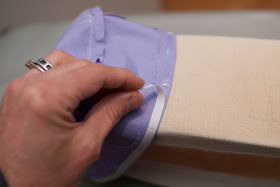 If you wanted to add some bias binding (or straight grain binding) then you could make it even easier by putting the hats wrong sides together (as if finished) and use the binding to finish the brim edge. 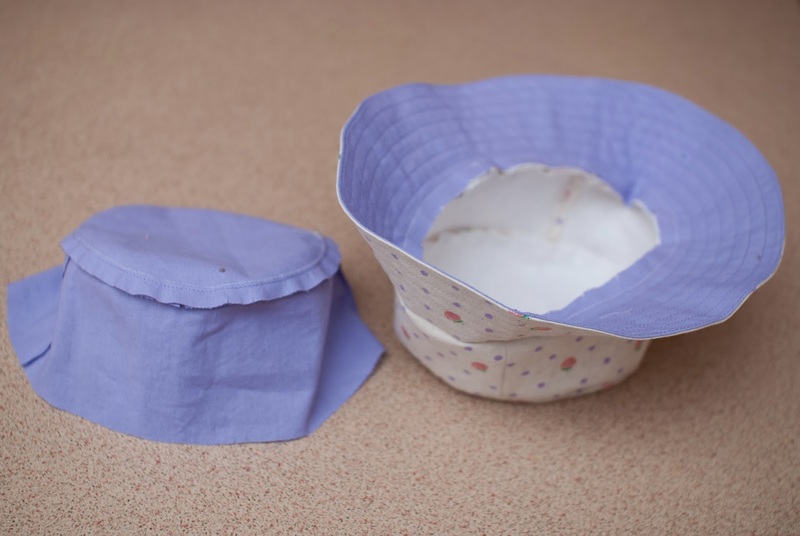 Construct the hat as per the instructions up to the point where you would handstitch the lining in. 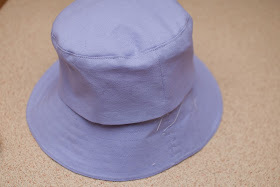 Now turn the lining hat right side out and try it on the hat and see how the folded edge lines up with the sewn seam. You may need to adjust the depth of your folded seam allowance of the lining piece is too small or too big. 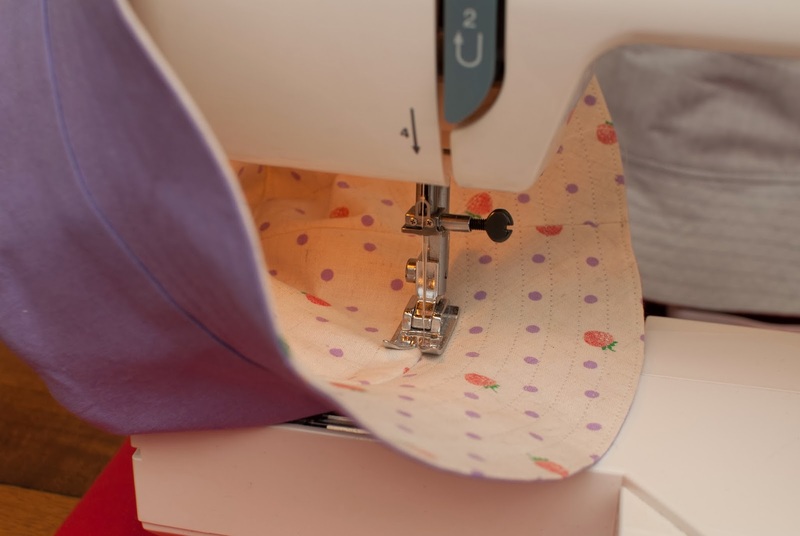 If you've been fairly accurate with your other seams it should be just right. 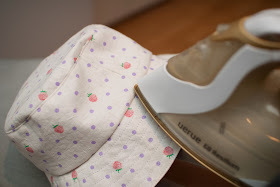 Take it off, turn it inside out again and iron the fusible web along the folded edge the whole way around the side wall of the hat lining. 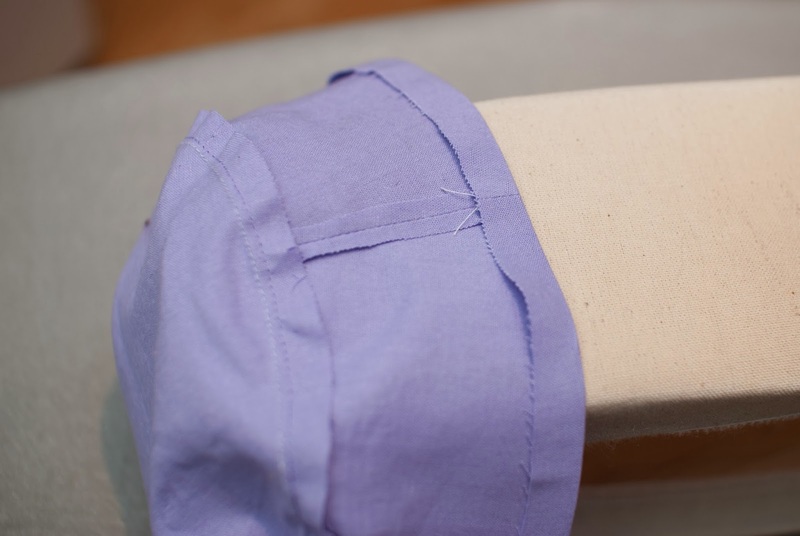 Make sure the folded edge is exactly on top of the stitched line where the outer side wall is sewn to the brim. 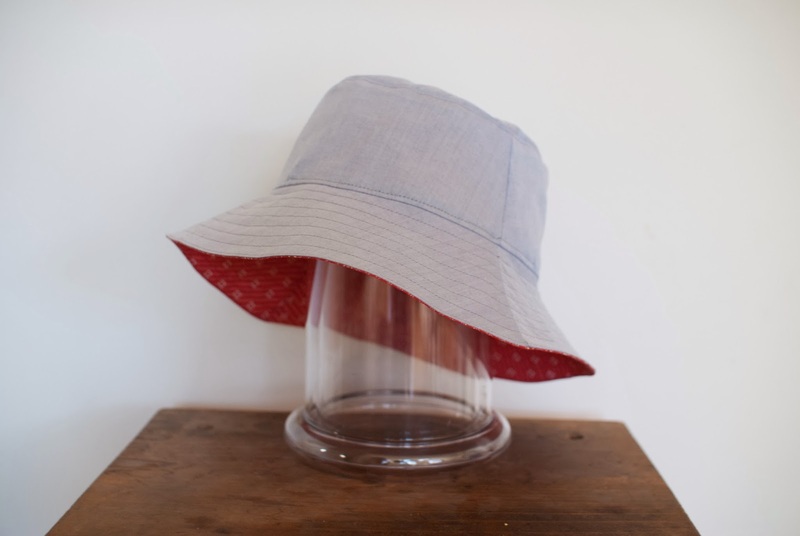 Here's where you really need a sleeve board as the hat needs to retain it's "openness" while you press. If you don't have a sleeve board then a rolled up towel shoved inside the hat can work. Now edgestitch around the hat. 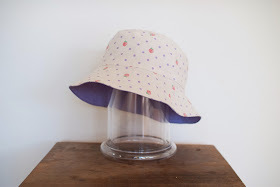 You'll be edgestitching both sides of the hat really nicely and it will be hard to tell which was the outside and which the inside when you're done! I love iron on adhesive and use it for small bound cuffs on sleeves, to avoid hand sewing collars before edgestitching them and especially for positioning bias binding so it looks great when viewed from either side. And ever since I made these hats we've been plunged back into some very cold weather. Here's wishing for sunny, hat days soon! i love your hats and what a great tip. i also love your little ironing board. i need one of those! Nice tip, I'll try it next summer! 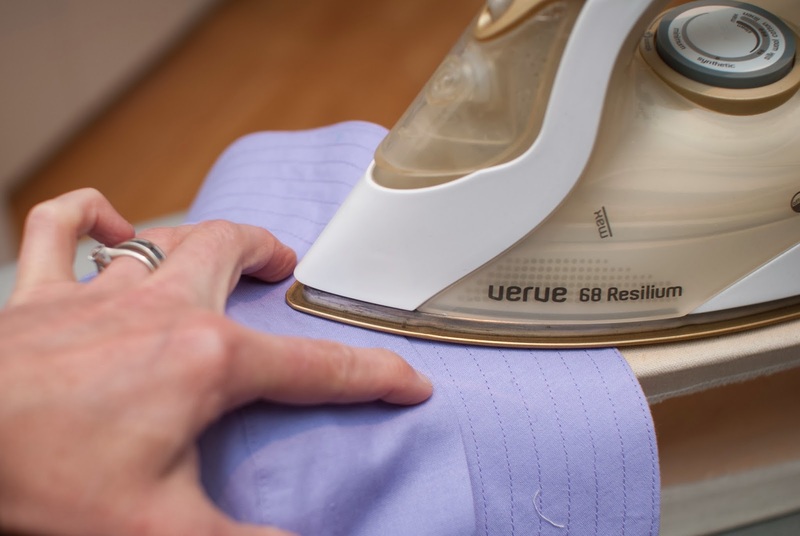 What size of iron on adhesive did you use?